For the last ten years, Winning Low Limit Hold’em has been the reference standard introduction to Texas Hold’em. Experienced hold’em players give this book to their friends who want to learn the game. Recently updated and expanded to include coverage of online poker and no-limit hold’em single-table tournaments, this is the one book that you need to start your hold’em career. “I always thought poker was a game of luck. After reading Lee’s book and applying the techniques recommended, it was as if I were in The Matrix. It all came clear to me. I simply saw the truth at the poker table.” – Antonio “The Magician” Esfandiari, Winner, 2004 L.A. Poker Classic and 2004 World Series of Poker $2000 Pot Limit Hold’em event. 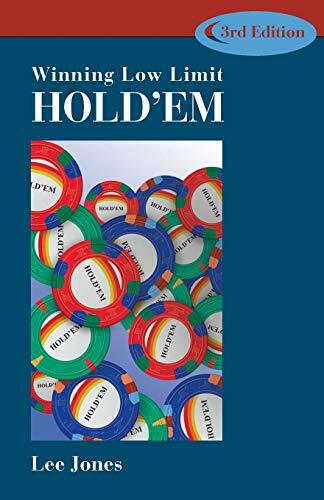 “I wish this book had been out when I started playing hold’em, because it is a great way to learn the game. If you want to put yourself on the path to becoming a top hold’em player, Lee’s book is the place to start.” – Greg Raymer, Champion, 2004 World Series of Poker.